It gives a theater critic reason to pause when so many accomplished young actors gather to perform a new work. 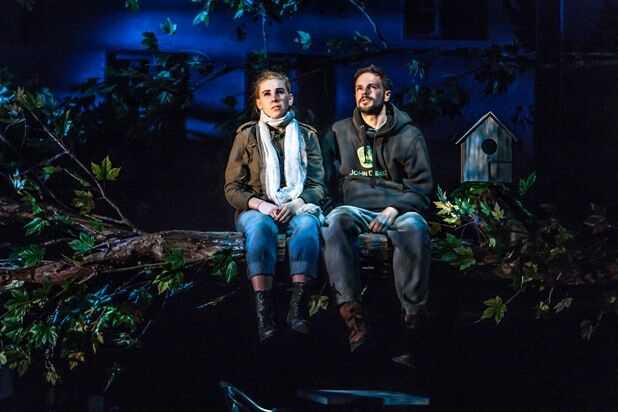 But the question needs to be asked: What attracted Zosia Mamet (“Girls”), Dolly Wells (“Doll & Em”), Alex Hurt (“Love, Love, Love”), Jonny Orsini (“The Nance”) and two-time Tony winner Norbert Leo Butz to Hamish Linklater’s new play, “The Whirligig,” which opened Sunday at the Pershing Square Signature Center? There’s certainly plenty of actor fodder in this story of angst and recrimination, about a young woman (Grace Van Patten) who’s dying of complications from drug addiction. Who’s to blame for Julie’s impending death? Her high school friend Trish (Mamet) who introduced her to the fumbling drug dealer (Orsini)? Or the girl’s alcoholic father (Butz)? Or the whole slacker New England town where she grew up, a place that’s seen better days? To his credit, Linklater doesn’t skimp on the number of characters he puts on stage, giving us an in-depth look at those townspeople. Much of “The Whirligig” is set in a local watering hole, which is a favorite spot not only for Julie’s dad, Michael, but a drunken teacher (Jon DeVries), the current bartender Greg (Hurt), who happens to be Trish’s husband, and the drug dealer’s older brother, Patrick (Noah Bean), who’s now a doctor but worked his way through med school by bartending there. Clearly, paths cross and coincidences abound like rabbits in a Massachusetts backyard. The play’s many revelations would be upsetting if they were credible. While Trish and Greg are refugees from some apparent opioid epidemic, Michael and his estranged wife, Kristina, represent the once-intellectual underpinnings of old New England. She teaches college and has written a book titled “The Entreaty of Versailles — Flappers, Appeasers, and the Resistible Rise of Viennese Watercolorist.” He’s a junior college instructor who used to be the artistic director at the Barrington Classic Stage, where he wanted to produce nothing but new works. You understand why that job didn’t work out when, in one scene, a boozy Michael attempts to teach Greg how to perform Shakespeare. Or is Michael now at Barrington and used to teach college drama? Linklater’s play covers 15 years, and its many short scenes aren’t always clearly identified as being flashbacks or flash forwards. “The Whirligig” begins with what’s almost the end of this play: Julie’s departure from the hospital to go home to die. Most of Act 2 delves into how she became an addict at age 17 and why her mother hates Trish so much. At least that’s what we’re told over and over again about Kristina. But from what’s witnessed on stage, Kristina achieves sainthood status with her forgiveness, and it’s a condition that’s contagious. Linklater ends his play with one big kumbaya moment that would challenge even the most ardent watcher of Lifetime TV. “The Whirligig” is presented by the New Group, and directed by its founding artistic director, Scott Elliott. He can be credited with putting together a great ensemble. Each actor is expert at introducing their respective character, and Mamet’s hard-bitten Trish is especially engaging. What Elliott hasn’t been able to do is prevent Mamet and others from overreaching when the script asks for a lot of screaming but deserves something less. Derek McLane’s set features a turntable and a big tree branch for Mamet and Orsini to sit on, chat, and ride up into the rafters and back. All that stage crafts keeps the action moving in circles, as well as up and down, but rarely forward.